The other day, I noticed that my readers were missing something important… Doorstops! 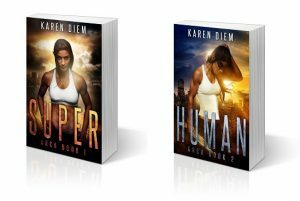 As a result, both Super and Human are now available in paperback format. These are good-sized 6X9″ paperbacks, light enough to read through comfortably, yet hefty enough to hold open a small, but feisty, door. They’re made with the finest standard paper and are just as huggable and readable as you would expect. Both should be available for order at most major bookstores. Sadly, those bookstores aren’t stocking their physical shelves with my books yet, but one can hope that someday, J.K. Rowling will cede some shelf space in the Fantasy/Science Fiction section to me. For now, the books are $12.99 USD. Power and other full-length novels in the Arca series will also be available in paperback format around their respective release dates. NOTE: The Amazon links are affiliate links. I might get a few cents eventually if you purchase something.